Good work! You’ve stopped eating cookies, and you’re recording your daily food intake in the Excel Calorie Counter. The pounds are magically melting away, and you’re keeping track of your weight loss. Here’s one more tool to help you with your healthy living plans – the Excel Calorie Burning Calculator. Continue reading "Excel Calorie Burning Calculator"
Did you eat too many Christmas cookies over the holidays? An extra dessert or two? If it's time to get back into shape, use this Excel weight loss tracker. It can store weekly weight records, calculate your weight loss, and show your progress in a weight loss chart. Continue reading "Excel Weight Loss Tracker"
I hope you had a wonderful Christmas, and with any luck, you're taking this entire week off. You might still be full of turkey and eggnog, so I'll just give you a small Excel tip today – something that's easy to digest. Instead of entering each SUM function individually, you can use the AutoSum feature to create all the grand totals with one click. Click the AutoSum button, to insert the Grand totals. The SUM function is added to each grand total cell, to sum the cells above, or to the left. 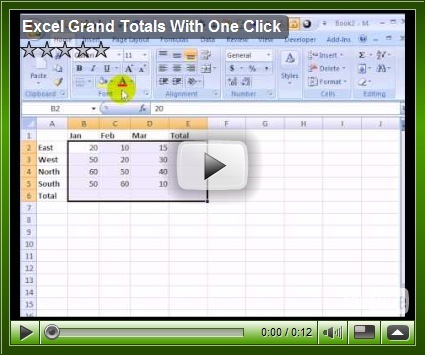 Watch this short Excel video tutorial to see the steps for creating Grand Totals in Excel with one click. P.S. 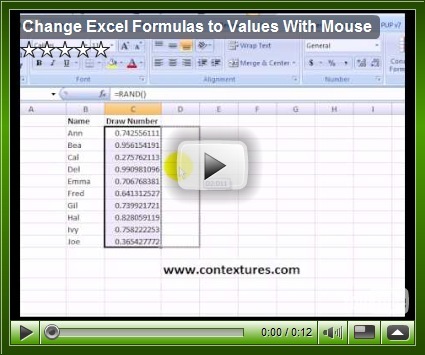 : For more Excel SUM tips visit the Contexture Excel SUM Functions page. Let it snow! One of the advantages of working from home in Canada, is that you don't have to go out in rush hour, on snowy days. I can sit in my office, basking in the glow of the computer monitor, mesmerized by the flickering of the modem lights. But eventually I'll have to go out to do some shovelling, in the sub-zero temperatures. Later, while thawing out, I'll create an Excel file, to track the miserable temperature and snowfall accumulation. We record our temperatures in Celsius, while our neighbours in the USA use a Fahrenheit scale. So, while I'm shivering on a -10°C day, it seems much warmer across the lake, where it's a balmy 8°F. I'm sure there are good reasons why the USA didn't switch to the metric system when Canada did, but for now, we can use Excel to convert the temperatures. When I convert that balmy 8°F, it makes me feel better – it's actually colder there, at -13°C. That formula isn't too difficult, but it might be hard to remember if your brain is affected by the cold weather. An easier way to convert the temperature is to use Excel's CONVERT function. Note: If you're using Excel 2003, or an earlier version, you'll need to install the Analysis ToolPak to use the CONVERT function. With the CONVERT function, you refer to the cell that contains the amount that you want to convert. Then you enter the original unit of measurement, and then the new unit of measurement. We want to convert the value in cell B2, from Celsius ("C") to Fahrenheit ("F"). Later, I can use CONVERT to see how many inches of snow we got, when the weather channel reports the snowfall in centimetres. 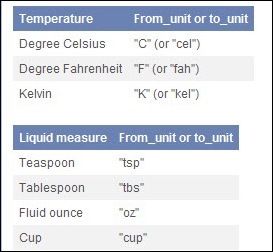 If you aren't sure what code to use for each unit of measurement, you can check the list in Excel's help for the CONVERT function. 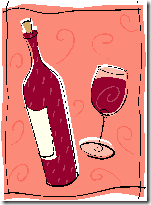 Now I have to go and figure out how many glasses of wine are in that 750 ml bottle. I think the answer might be – not enough! Continue reading "Excel Advent Calendar"
Today we'll focus on the TIME function, because one of my clients recently wanted some help with that. There are a couple of keyboards shortcuts for entering the date or time. To enter the current date on a worksheet, press the Ctrl key, and tap the ; key. If you want the date or time to update when you open the workbook, you can use a formula instead. My client's workbook had a cell with a process start time. He wanted to check if the current time was later than the start time. The formula in cell C6 compares C4 to C2. If the time in C4 is greater than the time in C2, the result is TRUE. Because C4 is empty in this screen shot, the result is FALSE. If we use the NOW function in C4, it includes the date, as well as the current time. Even though the time in C4 is 8:17 AM, its value is much higher than the 9:00 AM time in C2. I've added temporary formulas in column D, so you can see the numeric value for each cell in column C.
To calculate the current time value in C4, we can change the formula, to remove the date value. The TRUNC function removes the fractional part of a number, so we'll subtract TRUNC(NOW()) from the NOW function. The revised formula leaves the time value only in C4, and now the value in D4 is lower than the value in D2. The formula in C6 now shows the correct result of FALSE. On his blog, Chandoo, at Pointy Haired Dilbert, shows how to calculate Thanksgiving dates, although it might be a bit late to figure out when Thanksgiving is this year. In a lookup table, how can you get Excel to find the item that's the exact match, including the upper and lower case? For example, in this table, row 4 is M7 and row 5 is m7. There's a different value for each of these in column B. If I do a lookup for m7, I want the result to be 5, not 4. You could try a VLOOKUP formula, to find the value for m7, but it's not case sensitive. In the following screenshot you can see a VLOOKUP formula in the formula bar, and the result of 4 in cell E1. However, this doesn't work in our sample table, because it stops at the M7, and that's not an exact match for the lookup value m7. The Microsoft article has other sample formulas, including an INDEX MATCH, but they all have the same problem, stopping at the M7 above the m7 value. This is an array formula, so type the formula then press Ctrl+Shift+Enter. Curly brackets will automatically appear at the start and end of the formula. In the screenshot below you can see the formula, and the correct result of 5, in cell E1. The formula finds an exact, case sensitive match for the lookup value. On the Contextures website you can find more examples of the Excel INDEX function and the Excel MATCH function. 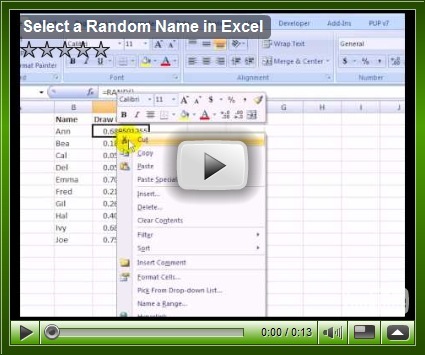 Continue reading "Create Bingo Cards in Excel"